In case you have any confusion regarding the exact definition of Medicare Advantage Plans, here’s the definition given by Centers for Medicare and Medicaid Services (CMS). Medicare Advantage Plans are a part of Original Medicare. If you are enrolling yourself in a Medicare Advantage Plan, it does not imply that you are dis-enrolling for Medicare. You will still be under Medicare; your Advantage Plan is being controlled by some private insurance firm that is liable to follow the rules defined by Medicare. Medicare Advantage Plan is different from Medicare Supplemental insurance. Medicare supplementary insurance (Medigap) works concurrently with Medicare Part A and B in order to provide extra coverage where original Medicare stops short. This plan can be purchased along with your original Medicare. Thus, the first thing we ought to know prior to purchasing a Medicare Advantage Plan is that we are not purchasing Medicare Supplemental insurance. Point-of-Service (POS): It is a kind of HMO plan that likewise allows you to avail certain services outside the plan's network at a higher price generally. Health Maintenance Organization (HMO): The customer gets services from a large network of local physicians and hospitals who work unitedly to provide good care. Preferred Provider Organization (PPO): In this plan, you can visit physicians and hospitals which are in the network or out of the network, but the services outside the plan's network usually cost more. Special Needs Plans (SNP): This plan is suitable for the people living in a long-term care facility and who are eligible for both Medicaid as well as Medicare. Private Fee-for-Service (PFFS): These plans generally are non-network plans from which one is able to receive care from any physician or hospital willing to accept the plan’s terms and conditions. Advantage Plans for 2012 cover the benefits of entire Part A (Hospital Insurance) as well as Part B (Medical Insurance) plans. It signifies that Medicare Advantage Plans tend to cover all the benefits under your Original Medicare. Nevertheless, these Advantage Plans can bill you different out-of-pocket costs. These are primarily the co-payments but can also be deductibles. Medicare Advantage Plans combine the insurance coverage of Medicare Part A and Part B with some extra benefits. Most of the plans also provide Part D prescription drug coverage. Advantage Plans work in the similar fashion as employer-sponsored medical insurance plans. They assist an individual in continuing the same level of insurance coverage that he/she has now or in the past. Considering the fact that there are lots of Medicare Advantage as well as HMO plans available in the market, it is quite important for you to pick the best insurance plan for you and your family. Advantage Plans can also provide additional insurance coverage, like hearing, dental, health or vision programs. 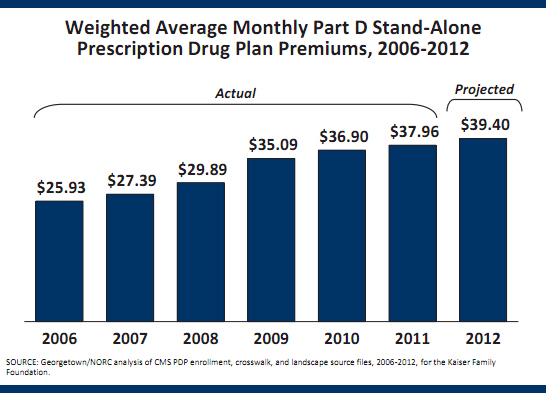 Most of the Medicare Advantage Plans also offer Medicare Part D prescription coverage. PPO Advantage Plans are pretty predictable causing them to be highly in demand amongst the elderly people. Elderly people get to pick from a big network of physicians and hospitals with their PPO Advantage Plan. It is also possible to apply for a PPO plan in conjunction with Part D prescription drug coverage included or without the coverage. What does your 2012 Medicare Advantage Plan include? Your 2012 Medicare Advantage Plan comprises of all the benefits of Part A Medicare plus hospital stays, nursing fees, home care etc.. It must be mentioned that this insurance plan does not give you hospice care. Yet, considering the fact that you've got to be a part of Medicare Part A in order to purchase Medicare Advantage Plan 2012, Part A takes care of your hospice care successfully. The Medicare Advantage Plan also comprises of the benefits of Medicare Part B including doctor visits, lab tests and screenings. Medicare Part D prescription coverage is included in your Medicare Advantage Plan. Several Medicare Advantage Plans also incorporate the benefits of additional services such as vision or hearing care. Buying a PPO plan could be a right choice for you and your loved ones if you are fine with the network size, but prefer to have the flexibility of visiting multiple physicians and hospitals for medical care. Medicare HMO plans are perfect for elderly people. Here in, one has to stay within the network of doctors and hospitals assigned. However, there are exceptions like out-of-network immediate care or emergency care. HMO plans permits an individual to visit a doctor out of his network, but at a higher price. Part D prescription coverage is included most of the times and getting referrals is mandatory as well as choosing a primary physician. Medicare HMO plan just might be your dream insurance policy in case you live in a large area.. This is due to the fact that it is comprehensive and cost sharing is quite low. On the contrary, if you are putting up in a small area with small network of doctors, a PPO plan would be ideal for you. Medicare PFFS Plans provide immense flexibility and freedom, but getting covered services can sometimes be dicey. One does not require using network and is able to choose his/her own providers. However, this plan decides how much they will pay doctors and hospitals and how much they will pay for other services. Under this plan, one can visit any physician or hospital if they agree to cure you. You would be able to join a Medicare Advantage Plan once you qualify for Medicare, or when the initial enrollment period starts. You will likewise require registering yourself for plans Part A and Part B at this point of time. Once you have joined plans Part A and Part B, you cannot be declined insurance coverage by any insurance agent in your region. Yet, additional rules are applicable on the individuals suffering from end-stage nephritic disease. Each private insurance firm that provides an Advantage Plan manages the registration procedure for its plans. You will require contacting the company directly and inquire about how to sign up. Membership in SNP plans is basically confined to particular groups of individuals. A SNP plan could just be a right plan for you if you are eligible for enrolling in both Medicaid as well as Medicare, or you are a resident of certain kind of institutions like nursing homes or if you are suffering from some chronic illness. Medicare Part D is invariably included in this plan and it must be kept in mind that SNP plans are meant to meet your needs by providing you a greater degree of co-ordinated case and care management. Coverage limits differ from plan to plan. Thus, one has to look at the details of the specific Medicare Advantage Plan to see what its coverage limits are. Advantage Plans that comprise of Part D prescription drug coverage might have extra restrictions like cost-sharing amounts that one pays for his/her medicines. What are the 'Advantages' to a Medicare Advantage Plan? It would be our pleasure to offer you the best plan for your requirements from an A rated insurer today. Contact us today and benefit from one of these leading Advantage plans.